Friend, listen to the desert cry. It is crying because it wishes to be a garden. It is a simple yet introspective tale, that in Polish could confuse the soul out of anyone trying to learn the language. Przyjacielu, posłuchaj płaczu pustyni. Ona płacze, ponieważ chciałaby być ogrodem. That and so many other Polish gems can be found on Adonai, which contains countless tiny tales under categories such as friendship, family, spirituality, love and death. While I do not consider myself religious, something that is relatively rare in one of Europe’s most religious countries, the website does label itself as Catholic. If you are too, that may be something that will spark your interest, if not – don’t let it discourage you. Good stories make readers think, while shorter stories are easier for foreigners to digest so it’s a good starting point if you find yourself looking for something short, sweet and in Polish. If you are searching for something more colorful, you can never go wrong with children’s stories, especially if they are classics that you are most likely already familiar with in your native language. Fairytale hits such as the Little Mermaid, Red Riding Hood, The Three Little Pigs, Cinderella and many others by talents such as the Grimm Brothers, Hans Christian Andersen or Joseph Jacobs, to name a few, can be found on Basn – a fairytale wonderland for kids and kids at heart. For authentic Polish stories the Polish Tradition – Legends website is a must. From stories about mills and wells, sleeping knights, Polish cities and how they came to be, you will find yourself enchanted with Polish storytelling and legends that to this day get passed on from one generation to the next. Although some of these stories might be intimidating in length, most will give you an accurate glimpse into the Polish culture and might even make you chuckle. As always, different stories might be more or less accessible depending where you are in your Polish language learning journey. However, whether you are a beginner or at an intermediate level, LingQ is always available to help you decipher all of the words, or just the tougher ones. Up next, Bajki-Zasypianki is a popular website for short stories that put you to sleep – on purpose. They feature stories and fairytales that are calming, happy and often written in a predictable pattern that rhymes or uses soothing sounds such as “Shh”. “Amelia and her enchanted night” is a great place to start. 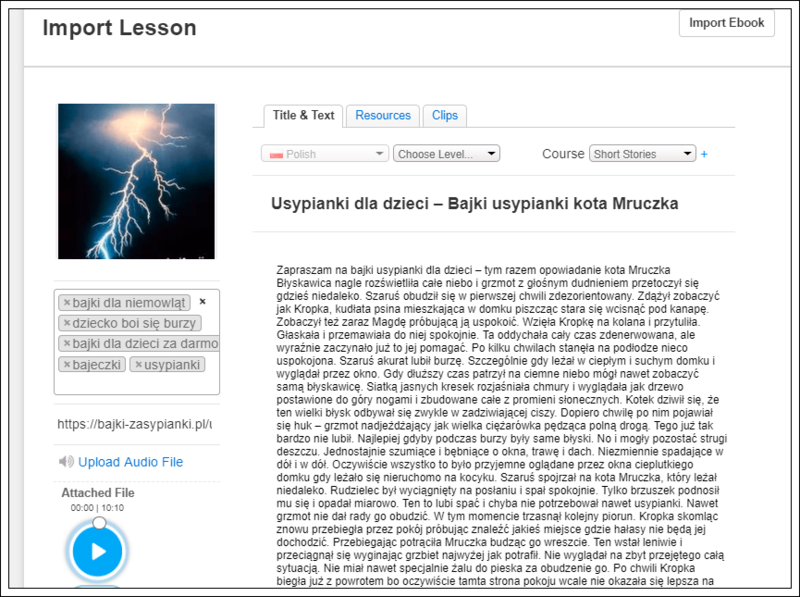 Not only does it feature lots of words from topics great for beginners (colors, clothing items, popular adjectives, etc), you can follow along while listening to the story being told by a native Polish speaker here. The story about a cat called Mruczek is another accessible story full of colors, descriptives and can be found narrated here. Now that you have a list of Polish short stories the trick is reading and learning them. To make your learning as efficient as possible, try LingQ. 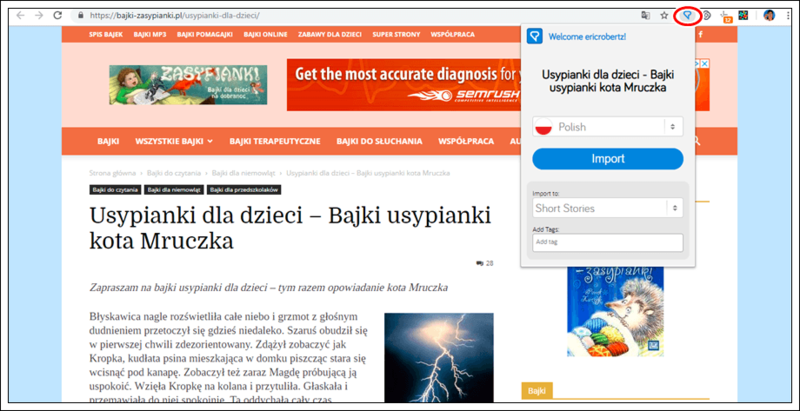 In short, you can store all your favorite Polish content into LingQ so you can read, listen, look up words, save them to your vocabulary, and much more. Not only that, LingQ comes equipped with 100s of Polish lessons as well. Sign up for LingQ then download the LingQ browser extension (a simple google search will help you find it). Once that’s installed, head over to the website I mentioned earlier. Click the LingQ extension and hit import. If you want to add the story’s audio, here’s how. First, click the settings button (3 dots) in your reader and then click edit lesson. After that, you’ll be sent to the import page. This is where you add your audio file (click the upload audio file button). Hit save and open after and that’s it. You now have a fully interactive lesson with audio. You can do this with other blogs, audio books, songs, and much more. You can even import videos from YouTube with a simple click of the LingQ extension. Best of all, LingQ’s available on your mobile form so you can study anytime anywhere. By reading and listening, you’ll be able to start picking up words faster than just using flashcards or grammar books. Not only that, it’s always funner to learn using content you love. So check out LingQ today and start learning Polish. You’ll make a breakthrough in no time.